buffalax takes foreign films and adds English subtitles to them, according to what he thinks the people in the video are saying. The results are hilarious. This one is a Bollywood movie dance number. Check out the other videos here and here! Yo yo yo! Get down with your retirement funds at mrbrownshow.com! Town council think tank in action! At mrbrownshow.com! Now Medisave is also a lucky draw! You wanna bet? Go to mrbrownshow.com! The board tells you that for bus 55, off-peak time is 12 minutes. The actual wait was more than 21 minutes. In fact, I think it was closer to 30 minutes. In the time I had to wait for the bus to come, I could have walked the 3 stops to my destination. And if it wasn't raining, I would have. THIS is the world-class public transport system we talk so much about? Want to give away my money for some legal digital music also so difficult. No wonder people use filesharing. Screw them lah, I am going to keep my money for other things. 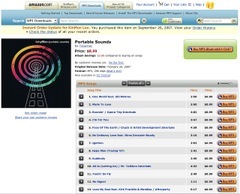 You can now buy MP3s from Amazon.com's new Amazon MP3 store. Neat. They have more than 2 million MP3 files to choose from, from labels like EMI and Universal, and the files are 256kbps and DRM-free (means no copy-protection), and most of the songs are US$0.89 each, less than what Apple charges for their DRM-ed stuff. This means you don't need to wait for iTunes Music Store to come to Singapore. I installed their Amazon MP3 Downloader (works with Windows XP, Vista and Mac OS 10.4) that you need for purchasing songs. And I even got a free song, Energy, from The Apples In Stereo. The browsing interface is not as elegant as the iTunes Music Store, of course, since you have to browse the music via the Amazon site, but it works. Previews are 30 seconds, and the tracks you download go into your iTunes with no problem. I've been cutting down on my CD purchases lately, since I find CDs take up space, and buying from iTunes was not possible without an American credit card and address (yes I know there is some convoluted method you can get around this, but dammit, I just want to give my money and get my music easily). Amazon allows you to purchase songs as long as you have a credit card. I did notice that the shipping address page, after you have selected your song, makes you select USA states, implying this is meant for the US only. I just chose CA for California, and some random zip code like 90210, and Amazon let the order through. 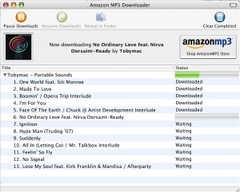 My Amazon MP3 Downloader is now downloading the songs into my Macbook, sweet. Was at the park facing the big screen outside Suntec City trying to play some Halo 3. Who would have thought it necessary to use sunblock to play a game? Halo 3 is here liao! 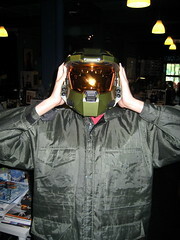 The boys were as excited as I was about the Halo 3 game I brought back, and the helmet from the Legendary Edition of the game. Behind got serial number one leh! No lah, you can't wear it. We just placed it in front of our faces when we took our photos. After spending 2 hours waiting to play Halo 3 in the sun, at the park in front of Suntec's big screen (yes, a game was played up on the big screen), the air-conditioned office was a welcome relief. A few days ago, Academy Award-winning director Ang Lee (李安) was in Singapore and I got to interview him about his new movie, "Lust, Caution". Lee talks about the set, why he chose Tang Wei as the lead, shares his thoughts about the negative Western film reviews, and censorship. And no, he did NOT cut 30 minutes off for the China version of the movie, as was reported by the news agencies. It was less than that. Also, some people believed he was working on The Hand of Shang Chi, a kungfu movie based on the Marvel comic. Well, in this interview, he clarifies that he is not. In fact, he has no confirmed new projects after "Lust, Caution". Watch the interview and hear from the man himself. For the high-res version of the video interview, you may wish to go to See What Show. Yes, I watched the movie liao. And yes, it was damn good. It was a thrill to meet Mr Lee. He was very humble and had no airs about him. Ryan and I got to drink free latte in the Shangri-La Valley Wing lobby while we waited for our appointment. If I had known the Shang was so hospitable, I would have taken a second glass, hahaha! 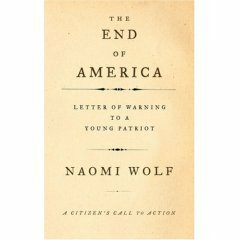 Seen on a decadent American comedy show, The Colbert Report, Naomi Wolf talks about her book, The End of America, A Letter of Warning to a Young Patriot. The book outlines ten steps that "fascist, totalitarian, and other repressive leaders" use to "seize and maintain power, especially in what were once democracies." Of course, this is talking about America lah. Watch the Colbert interview at CrooksandLiars.com. Read also her Guardian article. 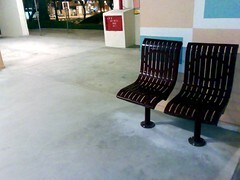 So the Aljunied Town Council has replaced a stone table and 5 stone seats because of gambling activities with these "elderly friendly benches". Er, 2 seats don't make a bench, people. And how is this an improvement over 5 seats and a table? And how much more accessible are these seats compared to the old round stone ones? 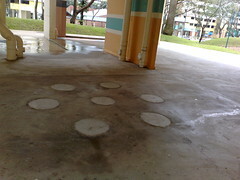 Oh, the traces of the former stone tables and seats have been cemented over too. So nice of them to cover those up. Thank you for your e-mail to Mr Yeo Guat Kwang. We have received complaints of gambling activities at this stone table and stools . These complaints were brought to the attention of the Police for their investigation and follow up. On our part, we have a programme to phase out the stone table and stools with more elderly friendly benches under our Barrier Free Accessibility Project. Residents can look forward to use the new benches when they are installed by the end of the week. We review I Now Pronounce You Chuck and Larry, No Reservations, and on DVD, we review the Firefly tv series and Serenity movie, at seewhatshow.com. Culling exercise at Malaysian beaches takes place. Find out more at mrbrownshow.com! Solve all your polyclinic queue problems now! Check out the latest solution to our country's medical problems! Queue up at mrbrownshow.com! the mrbrown show: who watches the watchmen? How to make sure the unauthorised don't get out? What kind of measures do we need to improve military security? Fall in at mrbrownshow.com! the mrbrown show: death to the blood suckers! Mosquitoes can kill! Kill them first! Check out the new extreme campaign message at mrbrownshow.com! Don't disgrace the criminal lawyer community! Do it right! Find out how at mrbrownshow.com! Disgraced Former CEO of a Charity Organisation? DFCCO can help you find a new job at mrbrownshow.com! DJ Sara is eight years old, and DJ Ryusei is five. And they have mad skillz.